Venice was once the center of a pocket-sized empire, and the point of departure from the West to the East. 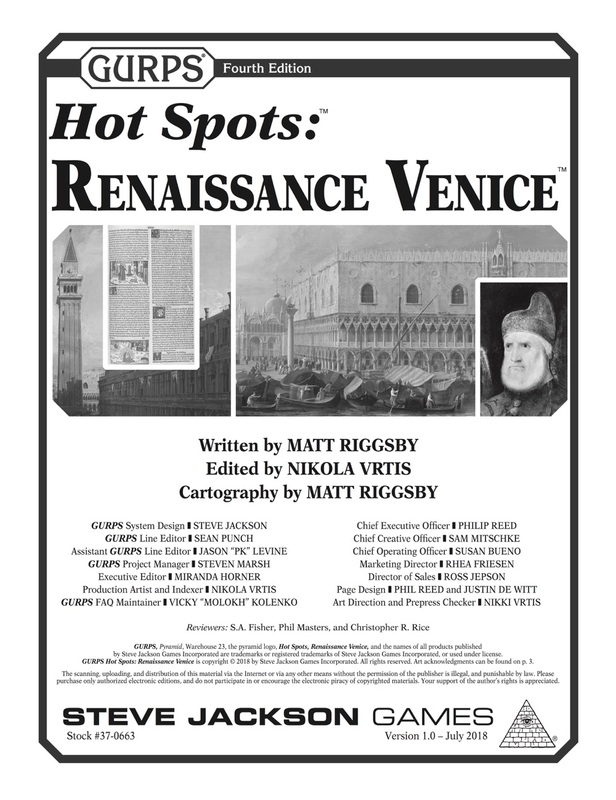 This era comes alive once more, with GURPS Hot Spots: Renaissance Venice. Discover details on this magnificent and unusual island city's people, government, military, food, architecture, entertainment, and more. 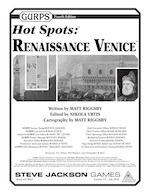 An invaluable companion to GURPS Hot Spots: Renaissance Florence, the information and maps in Renaissance Venice are perfect to add to your historical campaigns and tie into other era-appropriate Hot Spots volumes. Intrepid explorers can also use the suggestions for crossing this supplement with other GURPS realms, such as Dungeon Fantasy, Horror, and Infinite Worlds. Book your passage; adventure awaits! Check out the full GURPS Hot Spots line for more historical settings. GURPS Hot Spots: Renaissance Florence is especially useful! Venice was a major player in the Crusades. Discover more broad information about those conflicts in GURPS Crusades. For new adventure seeds for this supplement and a noble villa (with maps), check out Pyramid #3/117: Hot Spots.